These days, it seems like every wedding has its own site. It makes sense — if you have a website, guests can find all the information they need in one place. However, weddings are stressful enough without having to worry about creating a site. That’s where WordPress comes in. You can easily use the platform to create a gorgeous wedding website. It even enables you to add some key features such as wish registries, guestbooks, and more. The customization options are endless! In this article, we’ll discuss why you should use WordPress for your wedding site, and teach you how to make one in four steps (no wedding planner required). We have a lot of information to cover, so let’s dig in! WordPress isn’t the first platform that comes to mind when people think of a wedding website. However, the Content Management System (CMS) is perfect for more than just blogging. To give you an idea, right now WordPress powers over 30 percent of the web, so you know it’s doing something right. For wedding websites, you need a platform that’s easy to customize with the details of your special day. It also doesn’t hurt to have access to features that will take a load off your shoulders when it comes to planning. That includes keeping track of RSVPs, guest accommodations, gift registries, and more. You’ll also want a tool that makes responsive design easy. WordPress can easily handle these necessities. On top of that, the platform itself is free. So your upfront costs for setting up a website can be pretty cheap, particularly if you do it yourself. Building a wedding site with WordPress may not require many steps, but some of them may take you a while. If your wedding is on the horizon, now would be a great moment to start working on its website! The first step of creating any website is to register a domain name and choose a web host. Registering a domain name is pretty simple, so we won’t take up much of your time with it. Likewise, choosing which name to use shouldn’t take long. If your name is Jack and you’re marrying Susan, give jackandsusanaregettinghitched.com a go. Choosing a web host, on the other hand, can get tricky. Since you’re probably looking to build a website on a budget, you’ll want to stick to shared plans. Whichever provider you choose should offer good performance and an excellent support system. It should also play nicely with WordPress. With that in mind, we’re going to throw our hat into the ring with our own WordPress shared hosting plans. The basic tier starts at just $2.59 per month, and it’s more than powerful enough for a wedding website. 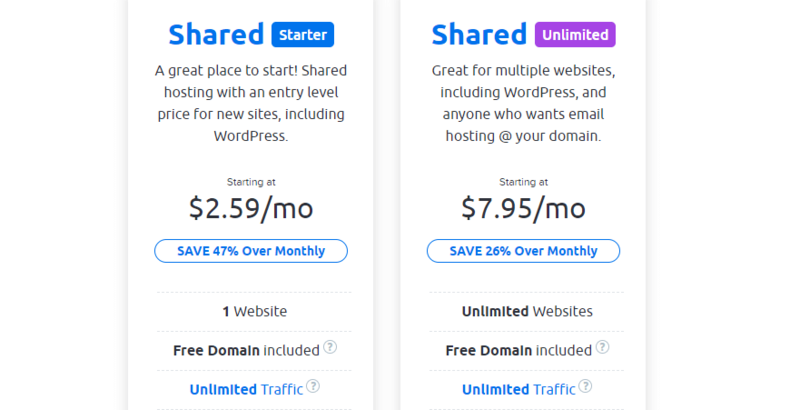 Once you sign up for a hosting plan, you’ll want to install WordPress. If you choose one of our plans, WordPress should be up and running already, so you can get started right away. 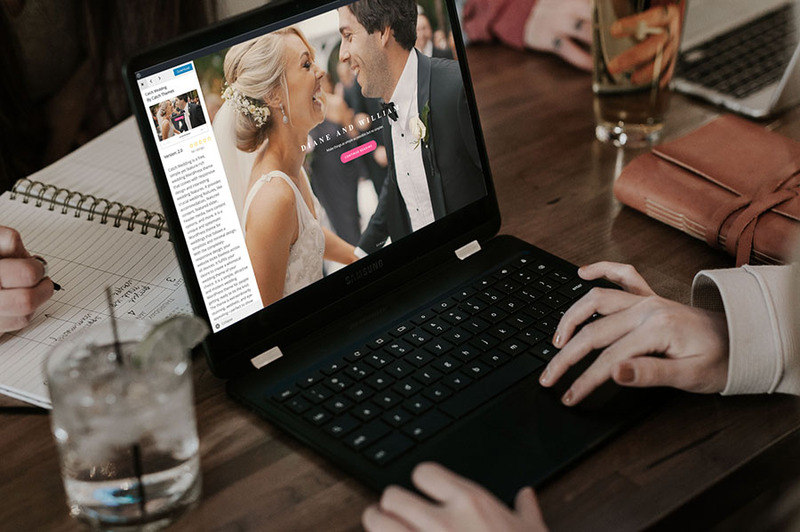 Wedding planning just got simpler — build your website with WordPress and DreamHost. The foundation of any great WordPress site is the perfect theme. WordPress themes are essentially a template for the layout of your website, complete with everything you need to design a beautiful site — think fonts, menu structure, etc. 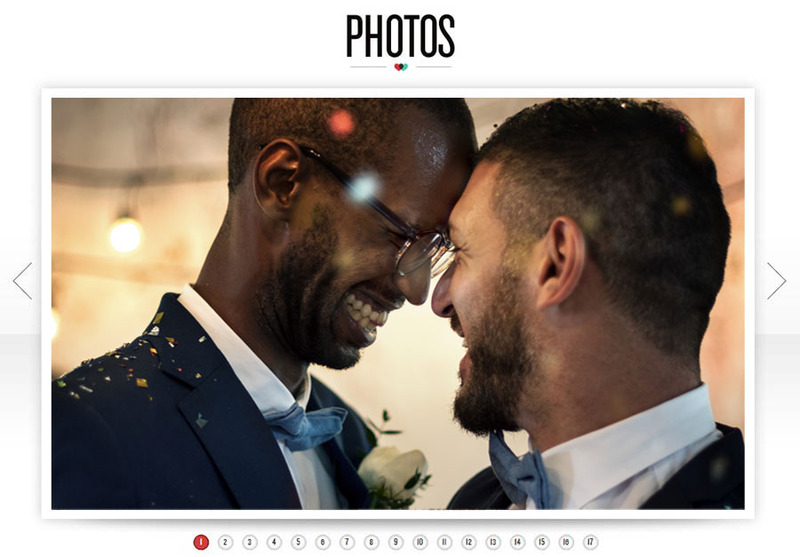 As far as wedding websites go, you need a responsive WordPress theme that enables photographs to shine. After all, most wedding websites are filled to the brim with photos of the bride and groom. The developers answer support queries. You’ll also want a theme that’s easy to customize. There are thousands of theme options to choose from, including free and premium themes, but we recommend you go with something that was built with weddings in mind. Take Jack & Rose, for example. This premium WordPress theme ($50) enables you to put photographs and videos front and center, which is perfect. 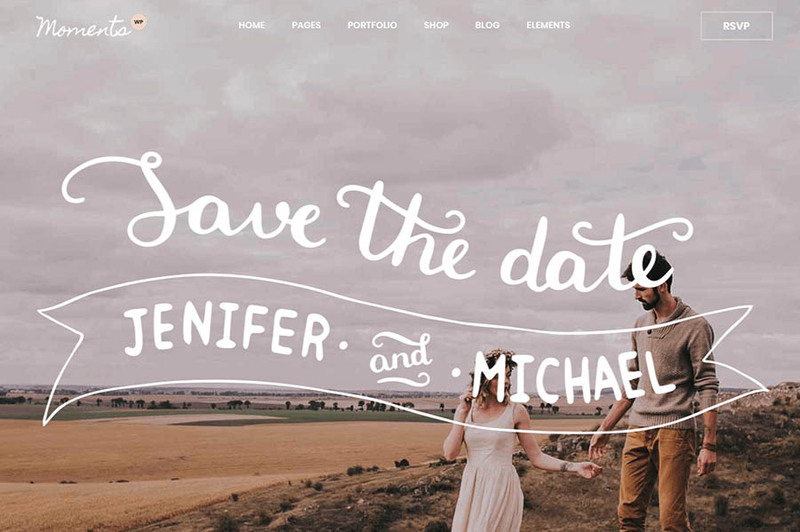 It also makes excellent use of pastel colors and elegant design — which are perfect for a wedding website — and includes a countdown timer (we’ll let you guess to which date). Another great option would be the Moments premium theme ($59). This one isn’t just for weddings — it also works well for other types of events. The wedding templates this theme includes are gorgeous. They all feature a minimalist design that’s perfect if you want to put together a simple, understated wedding website. Keep in mind — these aren’t the only choices out there. A quick Google search for ‘wordpress wedding themes’ will reveal hundreds of options, including free wedding themes on the WordPress directory. Take your time to find the perfect one, and then install it on your site. If you want to take your wedding website to the next level, you’ll want to use WordPress plugins. In this section, we’ll explore different features you might like to include, and introduce you to plugins you can use to implement them. A digital contact form enables visitors to your website to send their best wishes, ask questions without blowing up your phone, and more. We recommend trying out the Gwolle Guestbook plugin. With this plugin, you can add a dedicated guest book section to any of your pages. Visitors won’t need to sign up to use it, and you get the chance to review comments before they go public. The best part of any wedding — aside from marrying the person you love, of course — is that you get lots of presents. 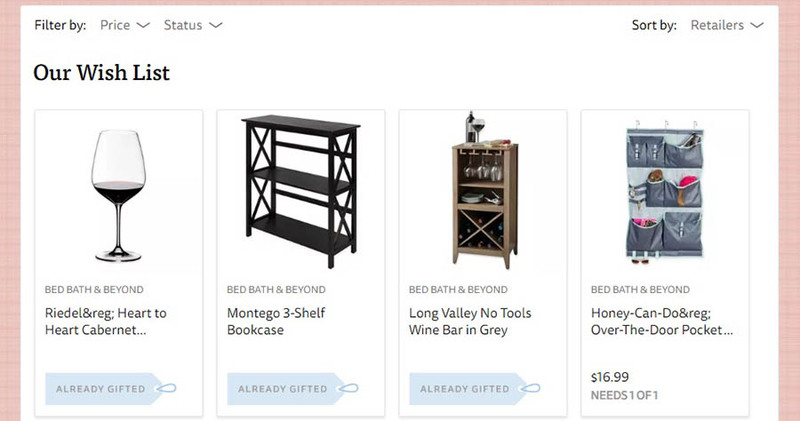 These days, online shops have made it easier to set up wedding registries. With a wedding website of your own, you can dedicate a whole page just to the gift registry, so everyone knows what to buy for the happy couple. For this particular purpose, we recommend the WPGiftRegistry plugin. Using WPGiftRegistry, you can set up lists of all the items you want and include images, URLs, descriptions, and prices. Best of all, it works for almost any item you want, as long as you can find a URL to buy it. Including a map on your wedding website is a smart move to make sure no bridesmaids and groomsmen get left behind. Just adding the location in plain text also works, but why settle when you can showcase a fancy map as well? 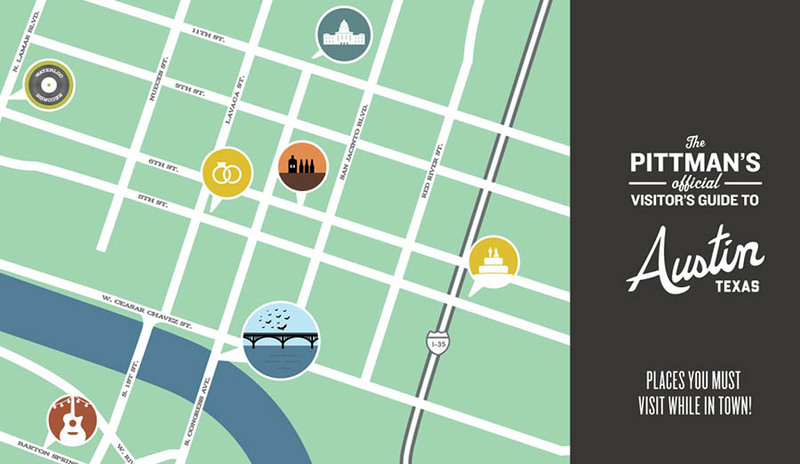 There are plenty of online map services you can use to integrate maps on your website. However, we’re big fans of Google Maps, which means we’ll focus on plugins that work with it. First off, we recommend the WP Google Maps plugin, which enables you to ‘create’ multiple maps and add them anywhere on your site by pasting in a shortcode. If you’re more of a widgets person, you might prefer using the Google Maps Widget. This plugin enables you to add a map to your sidebar or footer. Regardless of which plugin you use, you’ll end up with a smart-looking Google map on your website. One hallmark of wedding websites is a countdown timer that ticks the seconds away until you get to the altar. It’s easy to implement and adds a bit of fun to your website. There are plenty of plugins you can use to add countdown timers to WordPress. One of our favorites is Countdown Timer Ultimate, which enables you to add timers with fun designs. If you want something a little more classy, T(-) Countdown features some more toned-down styles, and it’s just as easy to use. In any case, you want to make sure your countdown timer is placed near the top of your home page. That way it’s easy to see, and everyone can keep track of the date. Last but not least, we have a photo album. Every wedding website needs a place where you can show off all your pictures in a convenient gallery format. WordPress supports image galleries out of the box. However, if you want to have a little fun with yours, we recommend using a plugin such as Photo Gallery by 10web. You might also want to give Image Gallery by Robo a chance. This plugin also supports multiple gallery formats and enables you to add social media sharing options. As far as WordPress plugins go, photo galleries are one of the most popular subjects. That means you have dozens of options to choose from, so feel free to look around at some more if you want to! Now comes the hard part, which is putting together all the pages you want your wedding website to include. You should now have all the tools you need to make that happen. To get you started, we’ll go over some of the most common pages wedding websites include, talk about their elements, and show you some examples. That way, you can narrow down what you want and get to work on it. 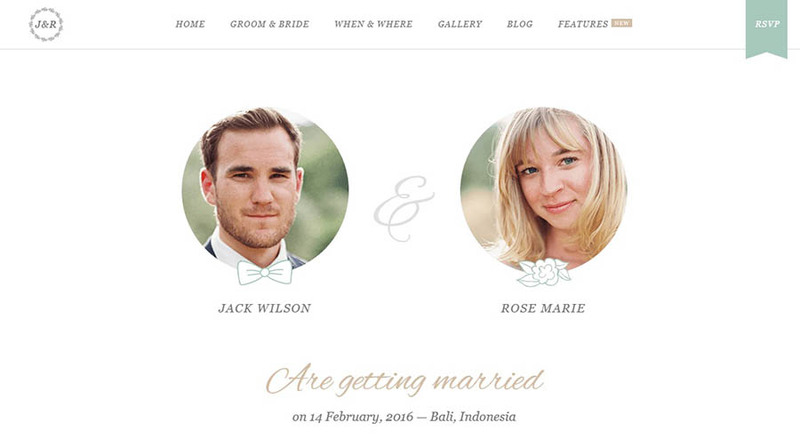 No wedding website is complete without a little backstory on the couple. An Our Story page is the perfect place to share how you met, how long you’ve been together for, and other details about your relationship. Earlier, we talked about how to add a map to your wedding website. 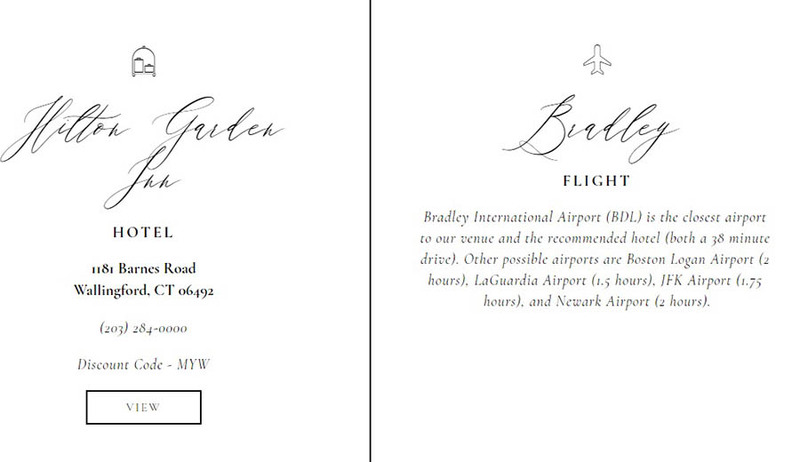 A Venue or Location page is the perfect place to include that map, as well as the full address for the location, and what time guests should arrive. A lot of people choose to get married in out-of-the-way spots. If you’re one of them, your guests will need someplace to stay. Usually, it’s your job to point them to the most convenient hotels. An Accommodations page is where you put all that information, including any special rates hotels are willing to give members of your wedding party. We also showed you how to add a guestbook to your wedding website. Ideally, that guestbook should have its own page, so visitors can browse through the comments at their leisure. Something as fun as your wish list deserves its own little corner on your website. A Gift Registry page should include all the items you want and where to buy them. You can also enable guests to purchase items online from your site, using the plugin we showed you earlier. One of the most important parts of any wedding is the guest list. 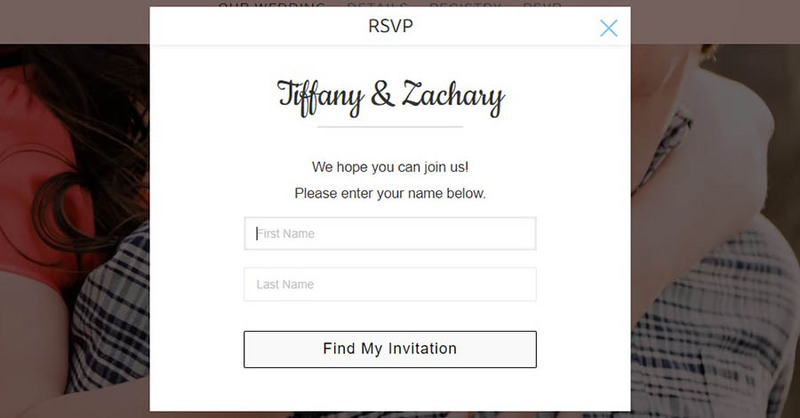 With an RSVP page, people can fill out a form to let you know if they’re going to attend and if they’re bringing a guest. Photo galleries are so versatile, yours doesn’t need its own page — it can go anywhere you want! Some great places to include a photo gallery include your site’s home page, and your Our Story page. 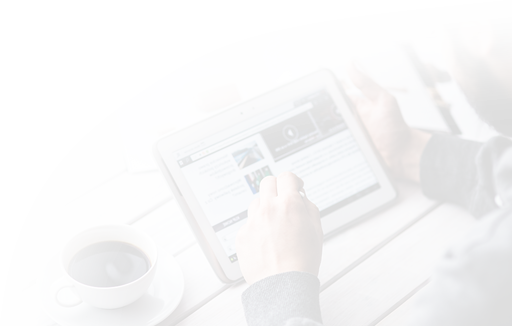 If you want your site’s visitors to accompany you through your entire journey, you can provide updates on a blog. Luckily for you, WordPress is the best blogging platform around. You’ll have no problem writing and formatting posts using its editor. If you want to create a wedding website on a budget, WordPress is a great choice. It’s is easy to pick up, and combined with the right theme and plugins, it makes building (and customizing!) 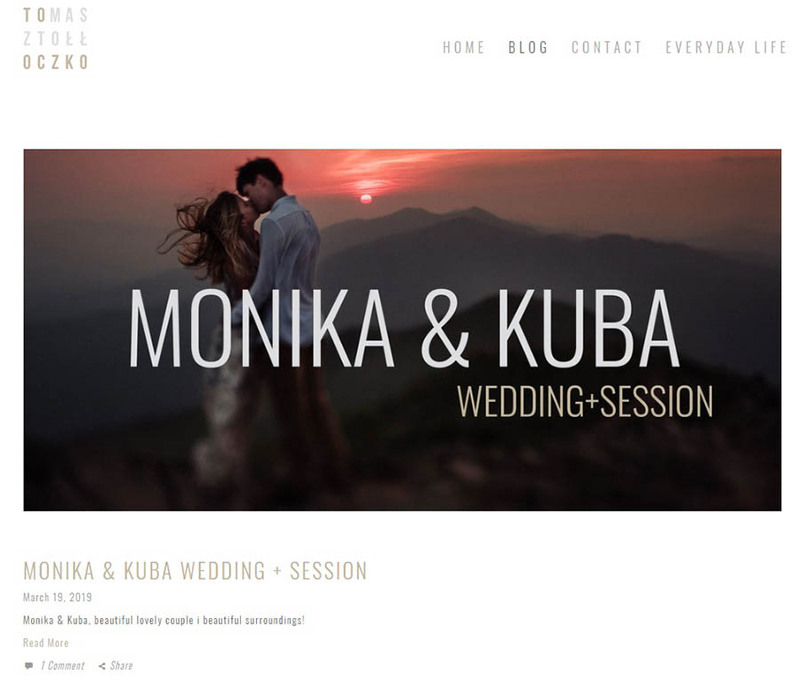 a beautiful wedding website much simpler. Do you have any questions about how to make a website using WordPress for your wedding day? Follow us on Twitter and let’s talk! The birds are chirping and the blossoms blooming, and you know what that means: it’s time to tackle your spring cleaning. Winter’s thaw is an annual reminder to clear out the clutter — and not just in your garage. Websites spawn their own digital dust bunnies and need an annual scrub to keep things running smoothly. This spring, take time to air out your website. Visitors will appreciate — and reward — a freshly scrubbed, updated site. 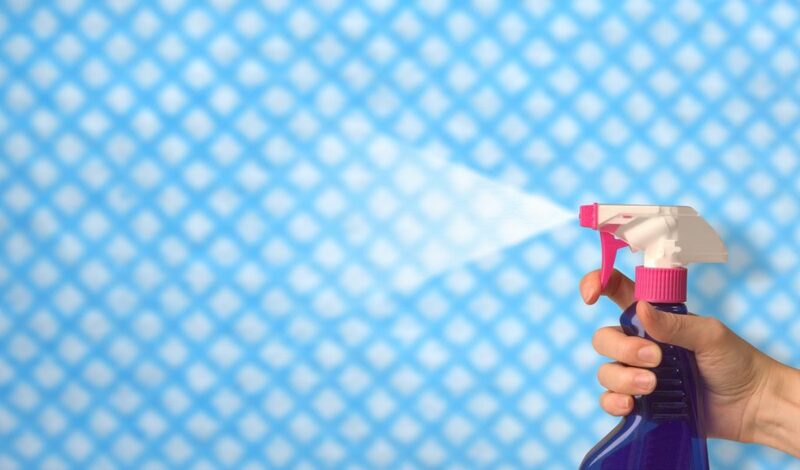 Superpower your spring cleaning with this checklist of chores and your website will be sure to pass any white-glove inspection. Sure, the info stuffed in your website’s footer can feel like a fussy detail, but it’s one that can speak volumes about the attention you pay to your content. Visitors are sure to question the validity and functionality of an out-of-date website, so exude relevancy and timeliness by making this quick update. Go a step further and ensure your copyright date is always current by adding a few lines of code. Don’t let your domain disappear — renew your registration now or set a calendar reminder to do it before it expires. Like dusting, this tedious chore is best checked off more than once a year, but hey, we all get busy. Broken links will frustrate your visitors, repel customers, and damage your search engine rankings. If you haven’t hunted down these pesky pests recently, find yourself a link checker and tracking. There are a number of tools that can help here, but we recommend Screaming Frog. There’s little more frustrating than returned or unanswered email. Make sure your customers’ queries are going to the right inbox by double checking and, if necessary, updating your email address and other contact information: phone, fax, addresses, social media accounts, etc. Make sure the info for all your brick-and-mortar locations (if you have them) is present and accounted for. While you’re at it, delete any superfluous or unused email accounts, and don’t forget to remove every reference to them from your website. Fill out any forms, take any surveys, sign up for every email list offered on your site, and make sure the process is simple, intuitive, and most importantly, functional. Check that comments work on your blog, and don’t forget to test-drive your checkout process from shopping cart to deposit of money into the correct account. Fix any bugs and consider ways you can smooth out the process. Operation and manufacturing costs fluctuate through the year, so take a look at your numbers and check your prices for fairness to the customer — and to your profit margin. Also, take a second look at the products you have listed for sale. Any slow movers that need to be rethought, repriced, or retired? Make sure to remove any discontinued products from your site. 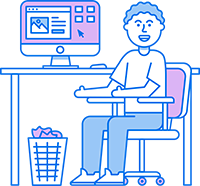 Scroll through your content to ensure that fonts, image sizes and style, and copywriting and grammar style are consistent throughout your website. Tidy up any inconsistencies to ensure a professional look. And while you’re at it, check for relevancy and timeliness too, especially in introductory posts, popular content, and product descriptions. Repurpose or delete dated content. Keep your website feeling fresh by updating your bio and polishing up the “About Us” page. Double check any key stats or numbers listed on this page as well. Don’t forget to update staff positions and job duties that may have changed in the past year, so credit is given where it’s due and customer queries are addressed to the right person. Nothing feels more stale on a website than old news, and little is more repelling than a “what’s new” post from 2013. When’s the last time you’ve updated your news page? There’s no time like the present: write a quick and catchy update, or consider nixing this page if you can’t keep it timely. If you have a calendar or events page, delete past events and update with current information. The policy page is an easy one to fall through the cracks, so make sure to pull it out of the cupboard and give it some love this spring. Check that your company’s current practices are accurately and clearly represented — make sure nothing is overlooked — and make changes as needed. Take a look at Google Analytics and sift out trends. Determine which pages are frequented the most, and which are getting a bit moldy. Polish up your popular posts and consider how you can get more mileage out of them — a social media post or campaign, perhaps? As for the dustier pages, bring in more visitors with links and shoutouts in more popular posts, repurpose the content, or consider axing them entirely. If the pages you want people to see aren’t getting enough traffic, it’s time to rethink how the content is teased and the information presented. Are your “subscribe,” “donate here,” and “buy now” links drawing enough attention? Rethink how you can shine up your calls to action so your website can better accomplish its purpose and clinch new customers. After you’ve dusted off the details, take a step back and look at the place your website calls home. 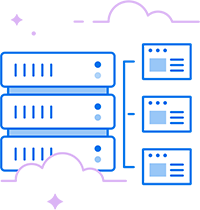 Is your current hosting plan working for you and your customers? Take a closer look at your analytics: are you seeing your website traffic grow over time? 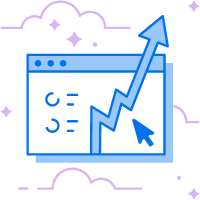 If you started out with shared hosting and are attracting more and more visitors, it might be time to upgrade to a plan that will enhance your site’s performance and stability. Consider whether your website would benefit from a VPS or a dedicated server. Everybody loves a sale. There’s nothing quite like browsing reduced items in the hopes of finding a great deal. You know this, and your customers know it too. The question is: how can you create an effective sale and make sure it brings both new and loyal customers to your business? If your store runs on WooCommerce, your job will be that much easier. This handy e-commerce plugin enables you to create a variety of different types of sales, without much hassle. However, you’ll still need to prepare and plan your sale carefully to make sure it becomes a success for both you and your customers. In this article, we’ll discuss the benefits of running a sale on your WooCommerce store. We’ll talk about the different types of sales you can create, as well as how you can promote and augment them. Let’s get started! You’re probably already familiar with WooCommerce. After all, it’s the world’s most popular e-commerce solution and is used to power nearly a quarter of all online stores. There are many reasons for this, but one is that the WooCommerce plugin makes it incredibly easy to start and run an online store, regardless of your level of experience. One crucial aspect of retail that WooCommerce handles particularly well is sales. Running a sale offers many benefits, not the least of which is that it helps drive more customers to your store. The fact is that customers love sales. A sale will also encourage people to buy more, and you can use it to attract both new customers and returning ones. For example, a sale can help sway users who may be hesitant to buy something at full price. Once they’ve made an initial purchase, you can follow up with more offers and information and turn them into regular customers. Fortunately, WooCommerce makes it easy to run a large variety of promotions. Best of all, the e-commerce platform also enables you to track your data after the sale is over, which you can use to improve future promotions. We’ll look at that option in more detail later on, but let’s not get ahead of ourselves. We still need to talk about what to do before you start your first sale. To ensure your sale goes off without a hitch and is a worthwhile experience for everyone involved, you need to plan it out thoroughly. First and foremost, you’ll want to define the length of your sale and decide when it should be launched. While it’s a great idea to run sales close to a big holiday or celebration, you shouldn’t restrict yourself to these times. Instead, aim to run several sales over the year, mixing up the duration of each discount. For example, you could run a flash sale that lasts for only a day or two, and later a week-long event. When and how long you run your sale depends largely on the type of promotion you’re planning. That’s why it’s important to consider the purpose of your sale, such as which products you’ll include. For instance, the above-mentioned flash sales are great for clearing out excess stock, while an exclusive members-only promotion will help you build brand loyalty with existing customers. You should also think about how you’ll promote your sale. This applies both off and on your website. It’s important to spread the word on social media and through ads but equally vital to make the sale visible on your site. Consider highlighting it on your homepage, along with what deals are included. You could even create a dedicated FAQ page with information about the deals, and an ‘On Sale’ page that features all included items. If you’re using WooCommerce, the plugin even enables you to augment your sales through the use of extensions and other plugins. You could add a countdown timer to appeal to your customers’ Fear Of Missing Out (FOMO), for instance, or create coupons that can be used to get special discounts. Now that you know how to prepare for your upcoming sale, let’s talk specifics. We’re going to look at eight types of promotions you can run using WooCommerce. You should be able to find at least one option on this list that suits your store’s particular needs (and hopefully more!). Let’s start at the top. A discount is the classic promotion. In short, this is when you specify a temporarily lower price for one or more products. 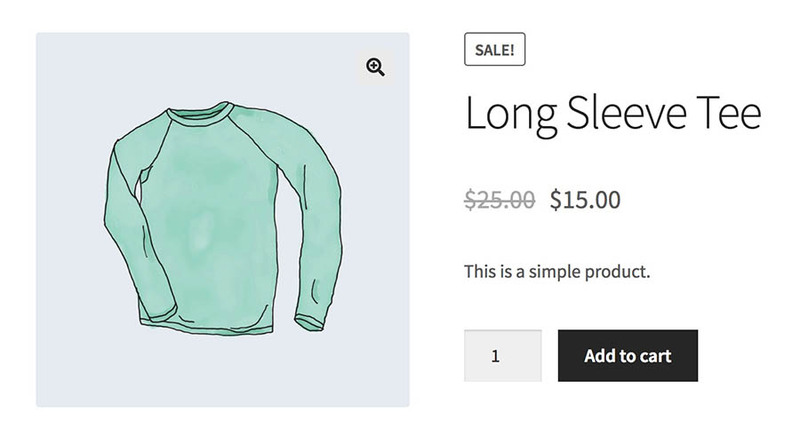 When you do this in WooCommerce, the regular price will usually appear crossed out with the sale price next to it. We say usually because the exact appearance may differ depending on your chosen WooCommerce theme. However, the basic functionality remains the same. When you’re editing a product, you can use the Sale price field in the General tab to set the new price without affecting the old one. You can also schedule a sale to specify when you want the new price to be active. This lets you choose both start and end dates. With this feature, you can easily apply your discounts in advance and even promote your sale ahead of time. This works particularly well for holiday-based sales. 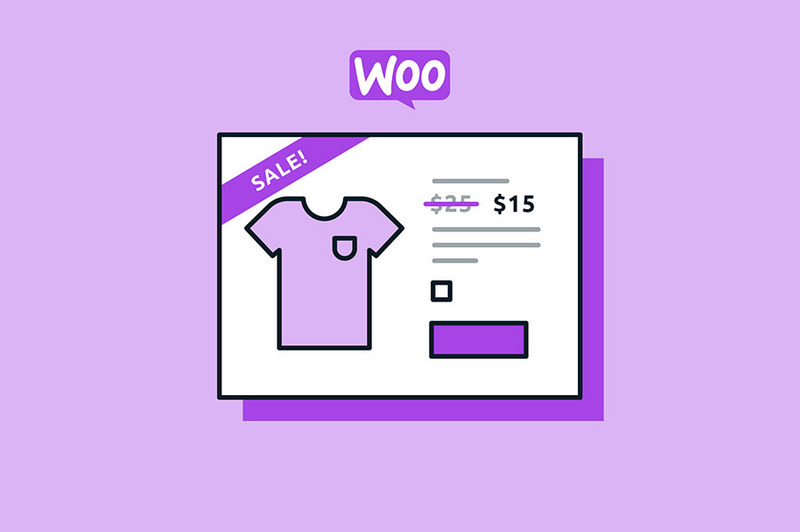 If you want to apply a discount to an entire category of products, you can do so quickly using a plugin, such as Woo Product Category Discount. This plugin enables you to set a percentage or fixed sale price to a specific category or tag. This can save you a lot of time, especially if you have a large e-commerce store with hundreds or even thousands of products. Coupon codes are another classic marketing tool for enticing potential customers. In case you’re unfamiliar with the concept, this is a short code that a customer can enter during the checkout process to get additional offers or discounts on their order. This is a straightforward and rewarding technique, which makes the benefit to the customer very clear. Most coupon codes will apply a percentage discount on a customer’s entire order or a specific item (excluding taxes and shipping) and will usually not be combinable with other offers. 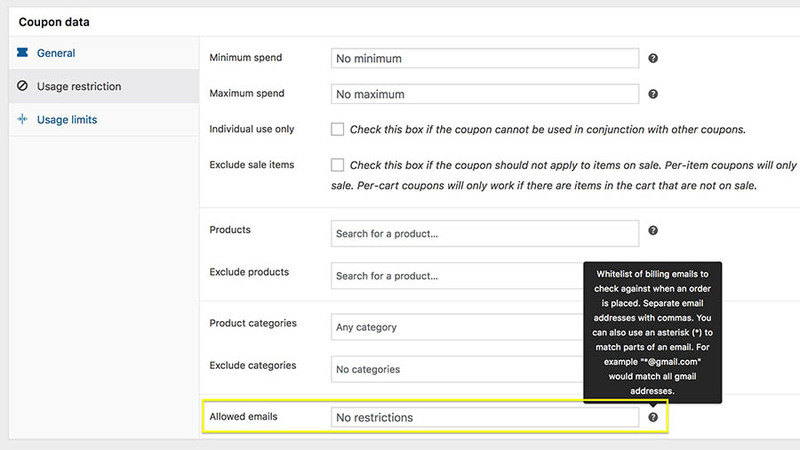 WooCommerce includes a lot of coupon management features by default. You can access them by navigating to WooCommerce > Coupons. When you add a new coupon, you can specify the code customers will use to apply the deal. You can also configure the discount the coupon will apply. This can be a fixed or a percentage reduction. Perhaps the most important settings are the usage restrictions and limits, which determine how and when the coupon will be valid. You should make sure to look over these options carefully; you don’t want your coupon offer to have any exploitable loopholes. When your coupon is ready, you can give it out to your users. How you distribute the code will depend on its purpose. A coupon code could be part of a bigger marketing campaign, or it could be intended only for specific customers. As we mentioned earlier, you need to consider your sale’s aim carefully before starting as this will let you know who the recipients of your coupon code should be. Did you know that free shipping is the single most important incentive for online customers? It’s not hard to see why. Shipping costs can inflate an order’s final price considerably, especially if the customer is located far away from where your store is based. The allure of free (or even just reduced) shipping can therefore be a powerful motivator, convincing them to complete their purchase. WooCommerce enables you to create a free shipping offer in a few different ways. First, you can use the coupon code method we described earlier to apply free shipping. Alternatively, you can also set Free Shipping as an available option for a particular shipping zone. Both methods give you a lot of freedom in deciding how the free shipping works and who can use it. For example, you could offer free shipping on all orders over a certain amount for a limited time, create a dedicated coupon that you distribute to particular customers, or spread the word via your social media channels. Either way, your customers will be sure to appreciate it. As we’ve mentioned, sales are a perfect way to highlight specific products. You can even take this a step further and place the spotlight on one particular item. You can create this type of offer with the Products of the Day extension. This tool enables you to specify one or more products for a given day, which will be highlighted on your e-commerce site using a widget. By default, this is simply a way to encourage the sale of particular products. However, you can sweeten the deal by also applying a discount to each daily item. For example, you can schedule a sale price for a product (which we covered earlier), and then add it to this widget. Not only will this technique increase the visibility of the promoted products, but it also gives your users a reason to check your site regularly to see which products will be on sale each day. A sale is not just useful for bringing in new customers. You can also use it to reward your existing users and members. Offering exclusive offers can significantly increase customer loyalty, which can, in turn, lead to improved word-of-mouth exposure. When it comes to WooCommerce, you have a number of options for this type of campaign. For example, you can create coupon codes that you can quickly distribute to select users, such as through an email newsletter. To ensure that this code can’t be leaked or used by non-members, you can even specify the exact email addresses that can use the coupon. 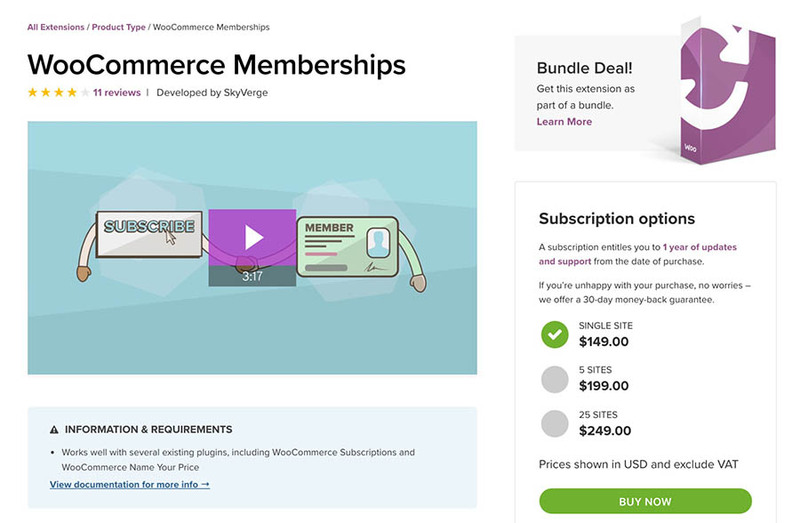 You can also use the WooCommerce Memberships extension, which lets you set discounts based on different membership tiers. 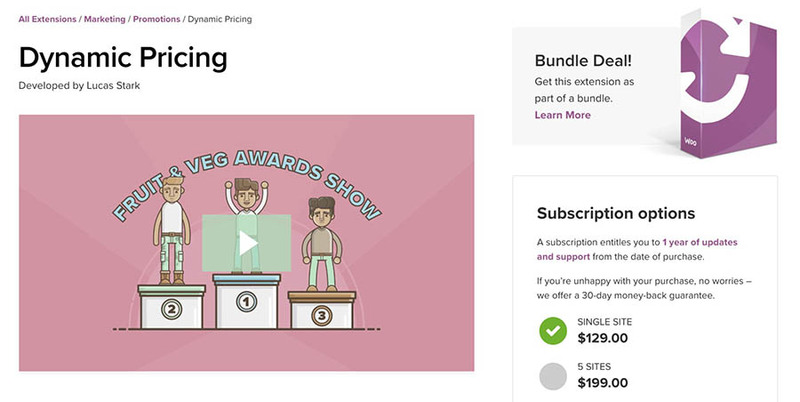 This extension provides plenty of features relating to sales, such as member-exclusive offers. You can also create discounted prices, free shipping, and even ’buy one, get one free’ promotions. A ‘Buy One, Get One Free’ (BOGOF) deal is, as it sounds, an offer where the customer gets one item for free when they purchase another. This could be used in many ways. You can simply offer two of the same item for the price of one, or include a different product as an extra when a customer purchases something complimentary. You could also specify different quantities, such as ‘buy three, get one half price.’ All you need is the right extension, which in this case would be Dynamic Pricing. As the name aptly suggests, this extension enables you to set dynamic prices for your products by specifying specific criteria. You can determine the number of items that will make the BOGOF offer valid, for instance. The discount will then be applied automatically when the user adds the right items to their cart. As with most promotions, the key to making this one work is to ensure that your users are aware of the deal and the specific criteria required. For that reason, it’s best to feature it prominently on your home page, and on individual product pages where applicable. We’ve already discussed the benefits of rewarding existing customers to build brand loyalty. Another smart way of doing that is by offering discounts that a customer can use on their next purchase. There are a few ways to do this in WooCommerce. The simplest is to create a coupon code that you distribute to your customers, which we’ve already walked you through. The Follow Ups extension makes this method even easier, as it lets you automatically email customers with a notification about the coupon code. You can also set up a rewards system that gives customers ‘points’ when they make a purchase. They can then use these points on later orders to get a discount that’s relative the amount they’ve earned. The Points and Rewards extension makes it easy to add such a system to your store. To make the deal even sweeter, you can offer double points during specific periods. This will further incentivize your repeat customers to complete more orders and can be used to increase sales during times when your store is usually quiet. This last technique is a cousin to the BOGOF deal we mentioned earlier. A minimum order discount is a promotion that’s applied automatically when the total value of the customer’s cart exceeds a set amount. For example, you could offer a 20 percent discount on all orders above $100. If a customer’s cart total were $112, the discount would bring the order amount down to $89.60 — an attractive deal. 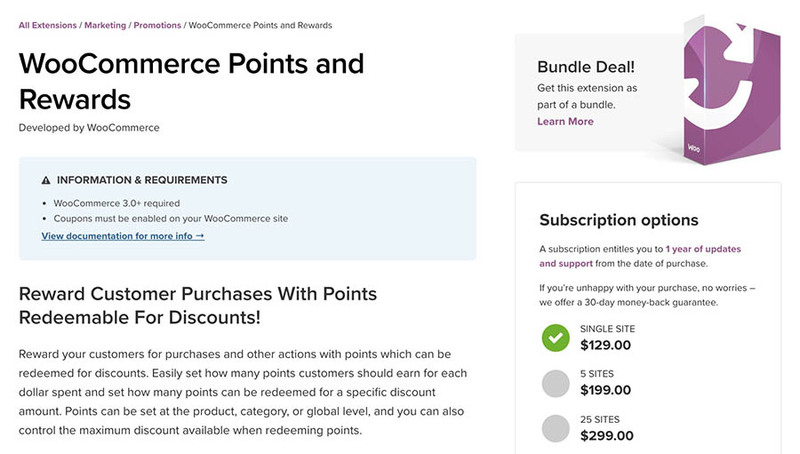 We recommend that you use Discount Rules for WooCommerce to put this strategy into action. This plugin lets you specify the exact criteria that must be met before a discount is applied. This tool also makes it easy for you to manage the discount and lets you change or remove it any time. Plus, it includes several other helpful sales-related features, such as BOGOF and dynamic pricing. You might think that once a sale is over, all that’s left to do is count the money you’ve earned and prepare for the next promotion. However, this is far from the ideal way of approaching your sales strategy. If you don’t take the time to analyze the results of your sales campaigns, you won’t be able to optimize future offers to get even better results. Interest and usage. How many users showed interest in your sale versus how many actually completed a purchase? This shows you whether you need to work harder next time to close the deal. Time and duration. You’ll also want to consider if the timing of your sales could be improved. To do that, you can compare the latest promotion’s results against similar deals that have run at different times of the year. Sale frequency. If you see a steady drop in conversions for each promotion, it might be worth your while to make sales less frequent. If users know another sale is just around the corner, they’re less likely to buy during this one. Take all of these factors into account, and you’ll be more informed and prepared when it’s time for the next sale! Running a sale on your online shop can be both profitable and enjoyable. All you need is a flexible e-commerce plugin and a little preparation to make sure you launch your campaign at the right time and with the perfect offer. Do you have any questions about how to run an effective sale for your business using WooCommerce? Join the DreamHost community and start the conversation!